We are in the business of making your floors, countertops, and other surfaces look great, whether we are cleaning and sealing, repairing, or providing complete restoration services. Our restoration services achieve outstanding results, so your natural stone, tile and grout, clay tiles and pavers, terrazzo, concrete, Corian, and other surfaces always look their best! That's something to feel satisfied about. Whether you have dullness and scratches from Rover and the kids tracking in dirt, stains from the family party last night, or chips and cracks from the delivery guy dropping furniture in the entry, Knoxville Marble Polish Premium Stone Care can restore your floors and stairs and help you keep them looking gorgeous all the time. Kitchen counters, bathroom vanities, and other surfaces see daily use and abuse, but they don’t have to look that way. If you find yourself with a stained, scratched, etched, or chipped top, don't have it replaced! We specialize in complete restoration of such surfaces. We can repair, clean, polish, and seal them to restore their former elegance. You'll be surprised at the dramatic results we can achieve. The steamy, water-rich environment of a shower creates unique cleaning challenges that can take a toll on natural stone and tile and grout. Don't settle for dull and dingy. We are well versed in safely removing hard water deposits, soap film buildup, and even mold and mildew and can get your showers back to top condition. We can safely and thoroughly clean your surfaces, and then apply a high-quality impregnating sealer to help inhibit staining as well the growth of mold and mildew. Inside your house you probably take all sorts of steps to clean and care for your surfaces, but keeping up the outdoor spaces can be a little more difficult. Consequently, stains, etching, fading from UV rays, and other damage can happen. We're just as good at taking care of outdoor kitchens as interior ones. Let's discuss your needs. Tile and grout, natural stone, terrazzo and concrete can all make for appealing exteriors and outdoor living spaces. But grit, grime, and the elements eventually diminish the appearance of your outdoor living spaces. At Knoxville Marble Polish Premium Stone Care, our expert technicians are experienced in cleaning and restoring the beauty of your outdoor surfaces, as well as applying the most appropriate sealers to protect them from future damage. Our exterior services include waterline repairs, too. Vertical surfaces need attention, too. We specialize in safely and effectively cleaning interior and exterior walls, including textured surfaces and cladding. With time and use, fireplaces and fire features eventually need some professional, heavy-duty attention. Why waste your weekend trying to deal with fireplace soot and grime, when you can leave the dirty work to us? From time to time, we get calls from clients curious about whether we clean and restore this or that — surfaces that don't neatly fit into one of the above-mentioned categories. If it's natural stone, tile, concrete, or terrazzo, the answer is yes. We even clean and restore fountains, monuments, statues, glass, metal, VCT and linoleum. Ask us about your surface. 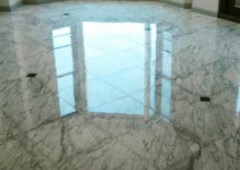 At Knoxville Marble Polish Premium Stone Care, we can instruct you on the proper day-to-day care of your natural stone and tile floors, countertops, and other surfaces. Visit our Caring For It page to see our free, downloadable Stone and Tile Care Guide and recommended stone-safe care products to help you keep your floors, countertops, and other surfaces looking great.